Pagans have been making associations between all sorts of things in life, in spirit, and in nature for thousands of years. Partly because of the belief that all things are connected and interconnected. Therefore it makes sense that some things work together, in a similar manner, in a supportive direction, for a common purpose. We relate color to chakras, candles, stones, energy and elements. But Pagans aren't the only ones who do this. We often think of water as being associated with the color blue. Well that makes sense, we're called the Blue Planet because of the amount of water on the earth. But we humans have a need to make associations of things in order to visualize them, to be creative and make connections. Red is associated with love, black is often associated with death and so on. In the terms of energy and metaphysical principles, how you feel connected to the energy around you helps you to join forces within nature and spirit, and create what you need or desire. The key to all this, is how YOU feel connected to the energy and the associations you create. I strongly recommend you write down your correspondences and keep them up to date. You want to create a consistency with your workings and maintain a balance. There will always be changes, but that's expected as you live, grow and learn. The alchemical traditions associate certain elements of nature to the life of the world or the Divine Universe. In order for life to exist in any form, these four elements must exist. And there are only four elements in life: Air, Fire, Water, and Earth. Alchemy helps to explain the relationships between total creation and the position of the parts which compose it. All parts are created from each other part, without all parts, there is nothingness. Without you, the Universe cannot exist. You, and I and all things seen and unseen are needed to make up what the Divine Universe is. Air feeds fire, fire dies by water, water is contained by earth, and earth creates the air. The cycle is meant to show the interconnection of all things, and the cycle of birth, life, change and transition. We use the elements in magik as the representations and components of Divine Energy. In this form Magik becomes "the science of energy manipulation" through an exercise to pull in energy (the birth), merge it with our own higher energy (life), mold it to our intent (change) and send it out to manifest as desired (transition). The elements also have their own characteristics or correspondences. The third element of the alchemical tradition. Water is the essence of love and fertility, the element of the nature of emotions. Astrological Signs: Cancer, Scorpio and Pisces. Represented by: Water, lavender fragrance, Fish, coral and sponges. The second element of the alchemical tradition. Fire is the essence of purification and change, the element of the nature of the will. Astrological Signs: Aries, Leo and Sagittarius. Represented by: Fire, candles, lights, dragons and the sun. The fourth element of the alchemical tradition. 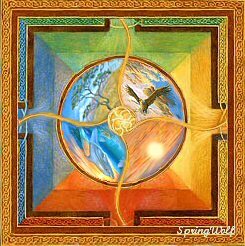 Earth is the essence of grounding and stability, the element of the nature of balance. Astrological Signs: Taurus, Virgo and Capricorn. Represented by: Dirt, sand, sage, Gnomes and goblins, a staff or stake, trees and plants. The Cardinal Directions are another characteristic of the Divine Universe that connects us all with nature and spirit. There are many people, books and websites, that say the Directions are set in stone and this is the way it is. If you deviate from that you're workings are wrong. I really can't relate to this static, set in stone kind of thinking. If one thing we have learned about life and spirit is that it's always changing and moving. Understanding Directional correspondences is similar to Astrological correspondences. There are things in life that are fixed and others that are malleable (can change). The Elements are some what fixed, but the Directions are malleable. So let's discuss that a little. Where the elements help establish your connection to the Divine Universe through spiritual energy; the Directions help you establish and balance the connection to the Divine Universe through physical energy. Where you are in the world does matter. And that's what makes Directional correspondences malleable. This principle allows for change and movement of an individual upon the Earth. Keep in mind the Earth is a big magnetic field. And just like the magnetic field around your physical body. But unlike your body the Earth is really 2 mirrored halves of the same field. What you see in the north hemisphere is a mirror of what you see in the southern hemisphere. And it's that mirror that we must keep in mind. For instance, what the North means to someone who lives in the Northern hemisphere isn't going to mean the same thing as someone who lives in the Southern hemisphere. Here in the U.S. the north can be associated with winter and cold. The farther north you go, the colder it gets. But that's not true for someone who may life in Australia. Just as the change in hemisphere alters one's connection, so does their location on a continent. Someone who lives on the east coast of the U.S. may not see their connection to the world in the same way as someone on the west coast. The land mass, bodies of water, climate differences and so on all have an affect on how you connect to and relate to the physical world around you. When you're establishing your connection between elements and directions, you need to sit down and look at the world around YOU and how you relate to it. Is the ocean to your east? Or North? Does the land rise to your West or South? How you sit within the work and it's directions is key to how you work with those directions. Forget about what others tell you, or what lists you've found online or in a book. For that matter, forget about the lists I have here on Pagan's Path. What matters is what you feel within your being. At some point in your spiritual and magikal life you're going to have to sit down by yourself and decide what you think. And here's your chance to do just that. Write out what you think the elements are in a poetic verse. For instance. For you, the wind might be warm instead of cold. The waters might be cool instead of warm. What do you "feel" when you think of each element? Does the fire rise or flicker? Does the Earth rise or spread out upon a vast land? Make your own saying and then think about where these elements fit within the cardinal directions of your location. Is it cold in the North or the South? Does the warm water flow to the South or East? Does the sun represent your fire? If so, when it rises in the East or sets in the West? Does the Earth rise up to greet you in the mountains of the East, West, or maybe some other direction? These are the things that make you connected to the elements, the directions and the Divine Energy around you. It's not how your friend feels, or your partner thinks, or what your Teacher says is right or wrong. None of those outside forces are going to be there when YOU sit down to do a working or to commune with the Divine world around you. So this is your time to think about where you are, and what you believe. You have the answers within yourself. Just sit down, meditate a little and ask your higher self what goes where and why.